in downtown Toronto to try an array of sparkling wines from Ontario, Nova Scotia and B.C. 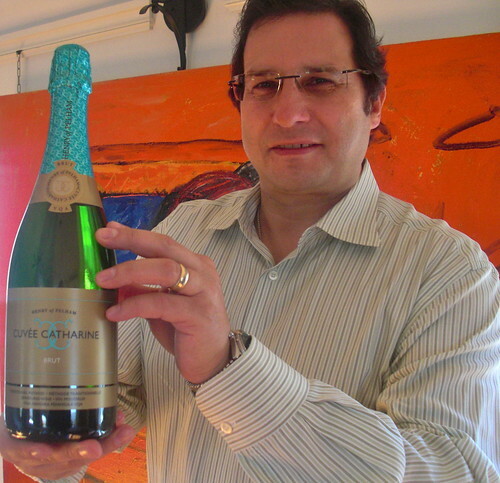 These were the best of the best from a range of styles that showed the potential of bubbles in the Canadian wine industry. Most of the well-known Canadian sparkling labels were part of the tasting, including Chateau des Charmes, Jackson-Triggs, Trius, Sumac Ridge and Blue Mountain, it was also nice to try some new kids on the block including Huff Estates, Summerhill, Hinterland, L’Acadia, Benjamin Bridge and both Vineland Estates and Fielding entering the fray with sparkling rieslings. 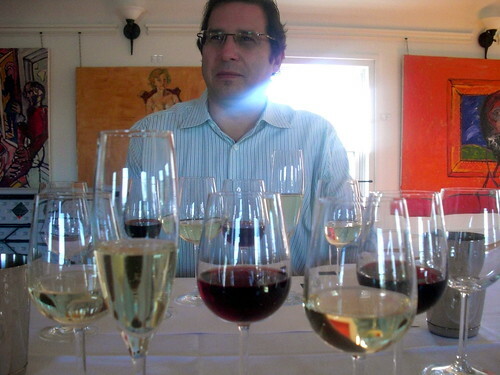 But one wine that really got are full attention was a mystery wine brought by Paul Speck of Henry of Pelham. It was an early preview of the winery’s first vintage dated sparkling wine; a blanc de blanc (100% Chardonnay) that would eventually see 60 months of bottle aging after partial barrel fermentation. That tete de cuvee was being made to celebrate the winery’s 25th anniversary of winemaking. The Specks brothers disgorged a few bottles three years into the aging process and we tasted one at the Canoe event. In its youth, it showed spectacular layered fruits, toast and vanilla. The tasters all agreed that we couldn’t wait to sip the finished wine. Henry of Pelham has finally released that wine. 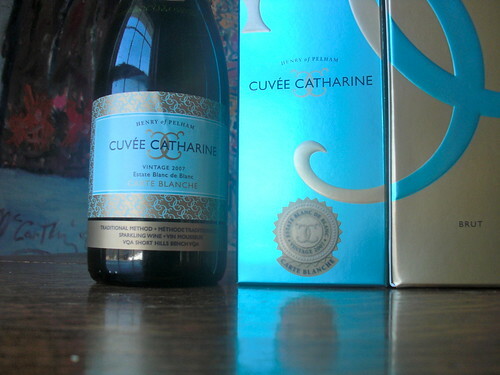 It’s called Cuvee Catharine Estate Blanc de Blanc Carte Blanche 2007, the first vintage dated sparkling wine from the Niagara producer and is part of the relaunch and redesign of HoP’s sparkling program that also includes both the Cuvee Catharine Rose Brut and Cuvee Catharine Brut. The Carte Blanche is now available at the winery or you can wait to buy it at Vintages on Dec. 8. I had a preview taste with Paul Speck recently at the winery, along with the Speck Family Reserve wines, the top tier at Henry of Pelham. Speck said the family wanted to do something special with its sparkling program and decided on a vintage dated, traditionally made style of wine that highlighted the Chardonnay fruit from its estate Short Hills Vineyard. Cuvee Catharine Estate Blanc de Blanc Carte Blanche 2007 ($45, winery now, Vintages Dec. 8, 92 points) — In a lot of ways, the first vintage dated sparkling wine from Henry of Pelham reflects the warmth of the 2007 season even though the Chardonnay grapes for sparkling wines are picked much earlier in the season to preserve freshness and acidity. The nose shows warm bread, toasty brioche, complex citrus, stone fruit and lemon curd. The mousse is soft and luscious on the palate with baked apple, lemon-citrus and creamy quince fruits to go with pastry, toasted hazelnuts and enough juicy acidity to carry the flavours through a long finish. This is a fleshy sparkler, to be sure, but it’s what you want from a wine that’s already five years old. Drink now or watch how it ages for a few years. Henry of Pelham Speck Family Reserve Riesling 2008 ($30, winery now, 92 points) — Henry of Pelham makes some of the longest-lived Rieslings in Niagara and they back that up by releasing in the retail store back vintages from time to time. I love that the winery releases its top wines (which it makes only in the best vintages) always with some bottle age so that consumers enjoy the wine as it is meant to be enjoyed. We tend to drink Niagara Rieslings (all Rieslings, in fact) far too young. With appropriate age, those wonderful petrol notes emerge and the acid softens to show a more balanced expression of this lovely variety. This is a gorgeous Riesling and one that will age gracefully for 10 years or more. The nose shows intense citrus-pear fruit with wet-stone minerality, petrol and an attractive waxy-lanolin note beginning to emerge. It is juicy and racy on the palate with that playful tension that makes Riesling so exciting, and through it all, a wonderful, fresh mineral note adds complexity and personality. It will age gracefully for 8 to 12 years. Henry of Pelham Speck Family Reserve Chardonnay 2010 ($40, winery now, 90 points) — The fruit for this Chard is hand picked from a vineyard that was shovel-planted in 1988 in the Short Hills. It is aged in 35% new European oak (virtually all French and maybe one Hungarian). Winemaker Ron Giesbrecht likes Cadus barrels and a little Damy for Chardonnay, both from the Allier forest. So particular is the regime for the Speck Family Reserve, the juice is taken only from the middle of the press. It is a ripe offering on the nose with apple and Bosc pear fruit, butterscotch ripple, cream and toasted vanilla notes. It has good weight in the mouth with an interesting lean, mineral note through the mid-palate to go with lush apple tart, poached pear, caramel-butterscotch and vanilla spice. There is a moderate vein of acidity to keep this perked up through the finish. Henry of Pelham Speck Family Reserve Pinot Noir 2009 ($40, 91 points) — I first tried this wine at a retrospective tasting of Ontario Pinot Noirs. It was tight and young when we tasted it and now, a year later, it is starting to open up. I would still, however, recommend decanting for a good hour before tasting. It has a bold expression of cherry, bramble, blueberry, roasted meat, currants and layered spice notes on the nose. It’s still tightly wound at the moment, with firm structure, tannins and vibrant acidity but showing red and black fruits, mocha-clove spices and a smooth texture through the finish. A treat, and one to tuck away in the cellar for many years to come. Henry of Pelham Speck Family Reserve Cab-Merlot 2010 ($50, 93 points) — When I think of Henry of Pelham, this is the wine that immediately comes to mind. Anyone who believes Niagara can’t make big, ripe Bordeaux style reds should try this in the best vintages. It performs like it is a Bordeaux with such a beautiful transformation as it ages and sheds the tautness of youth. They are tightly wound on release and eventually come into beautiful harmony if you have the patience, which I suspect you do if you’re shelling out $50 for a top-drawer red. The wine spends 18 months in French oak and is a blend of Cabernet Sauvignon and Merlot. The nose shows a brilliant array of black cherry, blackberry and crushed currants with mocha, vanilla and oak spice. It is highly structured on the palate with intense fruit, scorched earth, firm tannins and lovely secondary flavours of chocolate and cassis. Wait for this to come into balance. History tells us that this will be a blockbuster with a few years to soften out in the cellar. Thanks so much for the kind words, in particular towards our Carte Blanche. In a lot of ways this wine has been the intended goal of our whole sparkling program since it started in 1999, working our way up to this. One small note, the 2010 SFR Chardonnay is aged strictly in European oak (virtually all French and maybe one Hungarian) and the 2010 has 35% new oak. We like Cadus barrels and a little Damy for Chardonnay, both Allier forest. Ron, I will make the corrections in the post. Thank-you for that.